Eastfield are bringing their fast and furious brand of politically charged punk rock to The Lab tonight. Formed in 1996, the band have remained fiercely independent as founder member and vocalist Jessi told Peter Dennis. “There has never been a contemplation of Eastfield joining the mainstream,” he explains. “They probably wouldn't have us anyway. Talking about their lyrics, Jessi added: “It's good to be a bit tongue-in-cheek as satire and humour are a good way to highlight absurdities in the world. Eastfield have fond memories of playing in Northampton yet this will be their first gig here for many years. “We've developed a good relationship with Northampton,” he Jessi. “We initially started doing benefits for the local hunt sab group, which we've since continued to do over the last 16 years. The band is now celebrating its 21st anniversary with Jessi explaining there was never any contemplation of how far the band would go. He added: “It's fantastic that it has lasted this long and still shows no sign of imploding. “The fact that Eastfield hasn't sold out or changed much in 21 years is an achievement in itself. 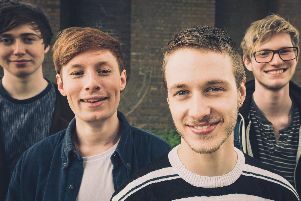 Eastfield play The Lab, Charles Street on November 17. Support is by Spring Park.